This article discusses some important but little-known differences between spagyrics and homeopathics. Both spagyrics and homeopathics are valuable healing tools, and they can work together to heal effectively and gently, as many of our clients can attest. But their differences far outnumber their similarities, and it has been something of a crusade of ours to explain these differences and clarify this issue in the minds of the public and healers, especially as spagyrics become better-known. First, we should examine some of the history of both systems. Spagyric, as a word and process, was invented by Paracelsus, the great 16th century physician. As many of you know, it means separate and recombine, and can be used to make herbal extracts of great power and energetic force. After studying Paracelsus, Samuel Hahnemann applied a small slice of Paracelsus’ work to create a new system, homeopathy. Homeopathy is an effective holistic healing system, but it was not part of Paracelsus’ work, being invented more than 200 years later. Homeopathy has gotten laid over Paracelsus’ work for so long and by so many that many people equate the two; an unfortunate misunderstanding that overlooks the fine points of both systems. When you realize that these systems were invented by two different people centuries apart, it becomes more apparent that they are different modalities, and that even if one was inspired by the other, calling them the same is incorrect. But, besides these historical differences, there are great differences in the systems themselves. Homeopathic remedies are created by extracting a substance in a menstruum, usually alcohol, then using successive dilutions and succussions of this “mother tincture” to create a remedy which is charged with a static or frozen vibrational signature of the original material used, but with none of its physical characteristics. It is true that Paracelsus used some methods of dilution to render some of his medicines safely potable or more gentle, but the total annihilation of the substance’s physical being is from Hahnemann’s work. Paracelsus repeatedly stressed the importance of working with all three levels of the plant’s being- the obvious physical of the Salt, the life force and intelligence of the Mercury, and the eternal core of the Sulfur. All of these levels are accessed, purified, and incorporated into the final spagyric through processes of concentration, and the final result in a properly made spagyric will be a very concentrated extract with the deep color, intense flavor, and low dosage typical of our products. The difference between our spagyrics and any homeopathics, then, is even apparent to the ordinary senses. To treat at the cause of the disease, not just the symptom, requires that all three levels be present in the spagyric to operate on the patient, who also has these three levels of being. Stripping away all but a reflection of the Mercury level of a substance (the homeopathic process), therefore, is not Paracelsian, and by definition, not spagyric. We should also note here that we are the only company to truly implement the Paracelsian philosophy in this regard, and uniquely offer three different levels of Spagyric medicines. That the original substance is changed so much as to be no longer its original self can be easily seen by looking at such homeopathic remedies as Hydrophobinum, Anthracinum, Belladonna, or Arsenicum Metallicum. If one ingested rabid dog’s saliva, anthrax, deadly nightshade, or arsenic in their natural state, illness or death would result; as homeopathics, these substances are used to great healing effect. The crux of homeopathy is this taking of a deleterious substance and, in effect, flipping or reversing it into a healing remedy. The homeopathic processing overrides the original substance- it is no longer anthrax, etc., but a homeopathic remedy. The same mechanism occurs with spagyrics treated homeopathically- the end results are homeopathics, and no longer spagyrics. This “flipping” was strongly demonstrated to us by a healer we work with who had been treating several patients with our spagyrics, and seeing great improvements in their illnesses. After running out of stock of our spagyrics, she obtained homeopathic preparations which another company had made from our spagyrics (unauthorized and against our advice), thinking they would be the same. This healer quickly discovered that, not only did they not heal as well, they actually made the patients’ ailments worse in most cases! She called us in a panic, not knowing what to do, but after only a few treatments with new stock of our true spagyrics, her patients were again back on their course of improvement and healing. This case shows how, just as something harmful can be reversed into a medicine, so, too, can the opposite occur, creating a reaction much like a homeopathic proving. That event, and other experiments we have done, are why we never recommend dilution of our spagyrics in any way. Spagyrics are made following a continuum of process and energy, and that continuum should be kept intact in their use. But they do work very effectively when used in conjunction with homeopathics, and many of our clients work this way. Homeopathics do a great job of smoothing out layers of symptom and imbalance, to allow the patient to become more clear, receptive, and open to the deeper long-term work that spagyrics can then be brought in for. We hope that this has been enlightening for you. We encounter this misunderstanding frequently, and are dedicated to ensuring that the alchemical healing lineage we follow is presented truthfully and completely. This misperception occurs more and more often as large European pharmaceutical companies realize the profitability of taking labour-intensive spagyric mother solutions and stretching them into sometimes thousands of gallons of sellable homeopathic product. We are perhaps old-school purists in this regard, but profitability is not the motive for our work — the facilitation of physical and spiritual healing is. Paracelsus pointed out that the vital energy of an herb is more important than the plant material itself. The four key steps of Spagyrics are: separation, purification, incineration and re-unification. After studying Paracelsus, Samuel Hahnemann applied a small slice of Paracelsus’ work to create a new system, homeopathy. Life is in Blood and Lymph and disease in its Vitiations, and the medicine is placed between two classes of phenomenon: disease and the normal state of the organism. The medical system of Electrohomoeopathy is an art of healing through herbs only. The inventor, Grafen Ceasre Mattei (Count Ceasre Mattei,1809-1896), who was an Italian to whom the title of Count was Bestowed by Pope Pius IX, was very impressed with the healing effects of Spagyrism and Homoeopathy. So, Mattei started to treat patients by making medicine with a unique process of cohobation and ultimately discovered a new theory and concept of health and disease after the 30 year of experiments. It is stated in the form of the principle that: “Life is in Blood and Lymph and disease in its Vitiations, and the medicine is placed between two classes of phenomenon: disease and the normal state of the organism.” The result of its intervention is, at first, to lessen then gradually destroy and finally expel the “evil.” So, in this way Mattei declared his new invention in 1865. Why the Name Electrohomoeopathy? Is it Different from Homoeopathy? 1) Hahnemann (inventor of homoeopathy), tried the effects of his remedies on the healthy man and afterwards, from his observations of their effects, he founded what homoeopaths call the “pathological genesis of homoeopathic medicines” which made known the sphere of their action on invalids. dynamisation, to produce the real effects by almost infinitesimal doses. prepared from 114 medicinal herbs by a very delicate process of cohobation. In alchemy, cohobation is the reassembling of the purified elements obtained by means of spagyrism. It is not concerned with the act of passing a solvent again and again over a substance to open it and to dissolve it as per the definition given by Glaser. A spagyric essence is clearly colorless to yellowish and smells very intensively aromatically. (i) By direct activation of certain pathways. (ii) By correcting malfunction in absorption, transportation and excretion. (iii) By redistributing mineral salts, trace elements, etc., which due to stress, disease or medication, have become locked up in the wrong place. For instance, infection and cortisone treatment induce the transport of zinc and iron to the liver and the release of copper to the bloodstream. In edema, sodium in excess quantity enters the cells. Electrohomeopathic medicines restore cell membrane integrity and restore proper absorption, transportation and excretion, which are essential in accordance with “transformation of matter” as per physiology. redistributing any scarce element to the tissues at potential risk or activating some alternative pathway. For instance, vitamin E and selenium have a number of overlapping roles. If vitamin E synthesis is stimulated, selenium deficiency would be less critical. Electrohomoeopathy is very different from the system of “the similar and the pathogeny” of Hahneman. It is true that Hanneman’s system is attractive on intellectual grounds, but it is very easy to get lost in it, even for a confirmed homeopath. The big dilemma, and the center of homoeopath discussions, is to know if a high dilution rather than a low dilution is to be used. This is not the case with spagyry which always turns to the composed substance and asserts that it is not necessary to dilute a substance to the infinite to increase its field and depth of action. The spagyric experience demonstrates this easily. Dr. Ajit Singh practices electrohomeopathy and acupuncture as well as conducts research on medicinal plants in Punjab, India. Dr. Singh can be contacted at: drajit_7@hotmail.com. Website: www.sbeamattie.com. Spagyric medicines are produced in such a way that no alkaloids or toxic molecules can be found in the final products. Though pure and undiluted, their efficacy may be compared with the “highly diluted” homoeopathic remedies. They have no known side effects. In my late 30’s I found myself at the end of my tether and with no other alternative than to return to what felt right for the sake of my sanity and the freedom of my soul, which was to draw. I had spent most of my life trying to please ‘others’ whose goals, expectations, and desires were insatiable. I had lost myself by allowing myself to be thus used. I had become a dead object, a tool, a trophy – of various people and systems. 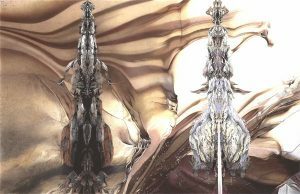 My first exhibition I titled “Meditating on Rock.” During the process of producing the 9 drawings that composed this body of work, I undertook an investigation into the nature of the human ego, thought and desire, assisted by a man described as a humanist philosopher – Jiddu Krishnamurti. (1) This was a journey into myself; a journey of understanding and self-knowledge based on ruthless honesty. I had nothing to lose, after all, I was already lost. Physical and psychological trauma had created a wound that was in need of healing but it had also annihilated my ego’s cunning defences and thus I was ripe for this undertaking and the confrontation with my shadow and my soul. As I drew, I saw a mysterious process emerging in my artwork of which I had not previously been aware. I first noticed it in hindsight as I looked back at what I had done; there were metaphors and symbols and apt revealing references in the landscapes I had chosen to depict, and also in the titles I had assigned to them. These things reflected my psyche like an open sunlit window into my heart and mind, or a mercurial mirror through which I could walk into my very soul. This both fascinated and unsettled me much as it did the early alchemists, whom in order to understand the nature of matter and the chemicals with which they were experimenting, involuntarily projected yet another mystery into it – their own psychic background. Drawing became a wholistic process of re-integration where virtually all of my activities and actions – even the music I was listening to at the time – became dynamically involved and relevant in relation to the understanding of myself. This was a “truth meditation” and not a honing of concentration or a consolidation of consciousness, nor a “zoning out” that involved suppression and resistance. There was a synthesis occurring – of conscious and unconscious elements of knowledge and action – and a transformation of “me.” I was breaking free and sprouting wings to meet my destiny. I was undergoing “individuation” – a spiritual transformation whereby a person becomes a psychological ”in-dividual” – a separate, indivisible unity. But whilst meditating on rock, I was not yet aware of this as the process was immediate and my knowledge and understanding for the purposes of conscious definition were still lacking. My next body of work, Exhibition 2, I titled “Reflection, Illusion and Reality.” Here, I delved deeper into issues of thought, memory, conditioning, war, peace, bliss, meditation, belief systems, seeking, death and disillusionment – the latter two topics seeming especially poignant as I found myself poised on the brink of a precarious, precancerous prognosis. I survived to mount Exhibition 3, which I playfully titled ” Drawing Out the Spirit,” simply because, firstly, I draw and secondly because I am interested in understanding the natural essence of all things. Little did I expect what unfolded as I flexed my new found wings. After exploring the nature of ritual, fear, conformity and beauty with the first three pieces, I found myself drawn to a mountainous alpine region of Tasmania called The Labyrinth. On the way there, at sunset, I was mesmerized by a shocking-pink cloud swirling swiftly around the top of a mountain like a snaking dragon chasing its tail. Interestingly the origin of the word “dragon” comes from derkesthai, which means “to see.” And the next day, whilst descending The Acropolis, I had a premonition of a friend’s death which was confirmed on my return from the wilderness many days later. To date, I had been exploring issues from a very rational base but from this point on I seemed to enter another realm – that of the irrational and the psychic. I had been very focused on “reality” and what I had perceived to be the “truth” of things and, like a kickback from the tension of the opposites or from being too far out on a rational limb, I was suddenly catapulted into a surreal irrational abyss – it was time to start flapping those wings! Drawing became a wholistic process of re-integration where virtually all of my activities and actions – even the music I was listening to at the time – became dynamically involved and relevant in relation to the understanding of myself. This was a “truth meditation” and not a honing of concentration or a consolidation of consciousness, nor a “zoning out” that involved suppression and resistance. Mt. Gould, The Minotaur, The Guardians, and Walled Mt. Hayward and Sparkes. (1982) The Concise English Dictionary. Omega Books. Rudolph Steiner. (1923) The Arts and Their Mission. Anthroposophic Press. Hayward and Sparkes. (1982) The Concise English Dictionary. Omega Books. J. Krishnamurti. (1991) Meeting Life. Harper Collins. Jolande Jacobi. (1978) ‘Symbols in an Individual analysis,’ from Man and his Symbols, Ed. C.G. Jung. Synchronicity and ecstatic states seeped into my life – the first truly memorable experience occurring on the 8th of June after climbing Mt. Amos, one of three small mountains collectively called The Hazards on the east coast. This was the day of the transit of Venus when Venus (love) and the Sun (light) united as one. Only later did I discover the possible significance of Venus transits for global unity in relation to major breakthroughs in communication. (6) Both Carl-Johan Calleman and Sri Aurobindo propose the next possible and necessary evolutionary step will involve the mind and psychic connections of oneness. Approximately one month later on my 44th birthday whilst still learning to fly, I came upon an ancient soul. I was resting, perched high on a rocky outcrop surrounded by thigh deep snow and inhaling a 360 degree highland vista. It was the middle of winter in the south-west wilderness, the sun was shining and I was being served “high tea” – I felt like the Queen of Sheba. The ancient Egyptians called the soul the Ba. 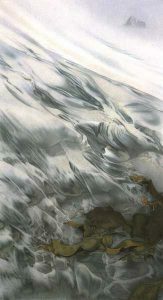 The next three drawings were rock and seascapes. The sea is an excellent symbol of the unconscious realm and a likely place for the birth of visions and invasion by unconscious contents. These drawings came under the title of “The Gold Nugget Trilogy,” and are various depictions of The Nuggets, four little islands off the east coast of the bigger island of Tasmania, which lies south of the mainland of Australia. Some alchemists hoped to produce actual gold in their exploration of the chemical world: others hoped to find the “philosophical gold,” the elixir, the panacea, divinity, immortality, God. All I knew was – the more I drew, the more meaningful coincidences occurred in my life and the more it felt like I was being led along by something far greater and more powerful than my petty, conscious ego’s apparent needs and desires. I began to have dreams like none that I had ever experienced before – extremely vivid and numinous. These were Oneiros – dreams as originally described by Artemidorus – dreams that awaken and excite the soul. I told no one, but, after having had the first few of these bewildering dreams, I fortunately found myself in possession of a manuscript written by a friend of a friend and based around numinous dreams that they themselves had had. This had an understandably calming effect – at least I was not alone. This manuscript was my first introduction to Jung. On entering physical existence at birth, inevitably we carry with us our eternal-divine being; but if its source is to be recognized, we must first become aware of the abyss lying between earth life and the regions of cognition which we must enter in order to know our own being. In the case of cognition one must travel a road of purification before passing the gate to the spiritual world: The abyss can be bridged by art. ‘ Rosarium, Art. aurif., 11, ‘ from Psychology and Alchemy, by C. G. Jung. (2000) Routledge. Ed. C. G. Jung. (1978) Man and his Symbols. Picador. Ed’s. Polly Young-Eisendrath and Terence Dawson. (1997) The Cambridge Companion to Jung. Cambridge University Press. Marie-Louise von Franz. (1980) Alchemy. An Introduction to the Symbolism and the Psychology. Inner City Books. “Here stands the mean, uncomely stone; Tis very cheap in price! The more it is despised by fools, The more loved by the wise.” (9) – Arnaldus de Villanova, from Jung, A Biography, by Gerhard Wehr. (1987) Shambhala Publications. The Latin word lapis means “stone” and the Philosopher’s Stone is a symbol of wholeness and immortality. Some alchemists compared the Alchemical Stone, the lapis, to the mystical experience of God within one’s own soul. Much to my amusement, I recently discovered that Alisanos was a Celtic god worshipped around Gaul and the C’ote-d’Or (the City of Gold) as the Spirit of the Rock. The number 8 has also been associated with immortality, gold, rebirth and resurrection. In Taoist philosophy, there are eight immortals, seven of whom are saints or sages, but the eighth is a girl who sweeps up the fallen flowers at the southern gates of heaven. “Mewstone Island, Morpheus and the Spirit of Mercurius,” Drawing No. 9, depicts Mewstone Rock, another island off the south coast of Tasmania. It also depicts surreal patterns traced out by salt water in sand around a piece of seaweed on South Cape beach. Medieval alchemists, who searched for the secret of matter in a prescientific way, hoping to find God in it, or at least the working of divine activity, believed that this secret was embodied in their famous “philosopher’s stone”. But some of the alchemists dimly perceived that their much-sought-after stone was a symbol of something that can be found only within the psyche of man. patterns at South Cape Bay. ‘Book of the Dead,’ from The Gods of the Egyptians. Studies in Egyptian Mythology. Vol 1, by E. A. Wallis Budge. (1969) Dover Publications, Inc.
D’arcy Wentworth Thompson. ‘ On Growth and Form ,’ from Chaos, (1988) by James Gleick. Penguin. Johann W. von Goethe, from Chaos. (1988) by James Gleick. Penguin. C.G. Jung. (2002) The Archetypes and the Collective Unconscious. Routledge. C.G. Jung. (2000) Psychology and Alchemy. Routledge. C.G. Jung. (1983) Alchemical Studies. Princeton University Press. C.G. Jung. (1989) Mysterium Coniunctionis. Princeton University Press. 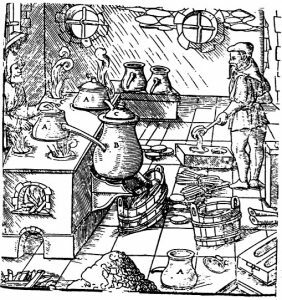 ‘VIII Exercitatio in Turbam,’ from Psychology and Alchemy, by C.G. Jung. (2000) Routledge. Ed. C G Jung. (1978) Man and his Symbols. Picador. Gerhard Wehr. (1987) Jung, A Biography. Shambhala Publications. it does not miss the path of its former life. Rosemary Clark. (2000) The Sacred Tradition in Ancient Egypt. Llewellyn Publications. Most of my drawings are quite photo-real with a surreality only in the detail and on closer inspection. This one, however, is largely surreal in its actual reality and thus an apt representation of the conscious and unconscious potentially blending as one. Putrefying seaweed, lowly like the mean uncomely stone and spurned, is a sulphurous substance, and for the alchemist Paracelsus, sulphur and salt gave birth to Mercurius. “The spiritus mercurialis is the alchemist’s guide and their tempter; he is their good luck and their ruin.” (10) Mercurius, god of revelation, is also a symbol for the spirit imprisoned in matter and of winged spiritual potential. The word “mew” is derived from a Latin word meaning “to change” and thus transform. Morpheus, god of dreams, presaged a rebirth – a moulting of my feathers like the royal hawks in the mews. According to the tradition Merlin had retreated to the solitude of the forest in order to escape from the troubled world, the world of King Arthur and the Round Table. According to Breton legends he had disappeared into a kind of rock tomb, a “tower”. Hence people also spoke of a “stone of Merlin”, set up far away from all the turmoil of the world of men. The coniunctio here ends with an incarnation of the Divinity. It is God coming down into the human being. That is what Jung has formulated in saying that what is seen from the human angle as being the process of individuation, as seen from the angle of the image of God is a process of incarnation. and water/rock reflections at Lake Sydney. Yes. ‘The Gates of Delirium,’ from Relayer. ( 1974) Atlantic Recording Corporation. David L. Hart. ‘The classical Jungian School,’ from The Cambridge Companion to Jung. Ed’s. Polly Young-Eisendrath and Terence Dawson. (1997) Cambridge University Press. ‘ ….the coniunctio, i.e., the union of an outstanding man, a king, with a queen etc., which is said to be an image of the union of the soul with God, the soul of man being thought of as feminine: the anima marries God in the moment of highest religious ecstasy and therefore in that moment the mystic is a bride who marries the Godhead…….the unio mystica of the soul with God..’ Marie-Louise von Franz. (1980) Alchemy. An Introduction to the Symbolism and the Psychology. Inner City Books. C. G. Jung. (1983) Alchemical Studies. Princeton University Press. C. G. Jung. (1989) Mysterium Coniunctionis. Princeton University Press. ‘ In our text the skinning refers especially to the head, as though signifying an extraction of the soul…. ‘ In alchemical literature, the procedure of transfixing or cutting up with the sword takes the special form of dividing the philosophical egg. It, too, is divided with the sword, i.e., broken down into the four elements. … The dividing sword seems to have a special significance in addition to those we have noted. The “consilium coniugii” says that the marriage pair, sun and moon, “must both be slain by their own sword, imbibing immortal souls until the most hidden interior (i.e., the previous) soul is extinguished.” In a poem of 1620, Mercurius complains that he is “sore tormented with a fiery sword.”……It is the fiery sword brandished by the angel at the gates of paradise that torments him, and yet he himself is this sword……In both, the sacrificer is the sacrificed, and the sword that kills is the same as that which is killed…..
C.G. Jung (1983) Alchemical Studies. Princeton University Press. I draw from a state of love with a clear and open mind and so my drawings are spiritual revelations. I draw out the spirit and the spirit draws me, in a dynamic cycle of inspiration and reanimation; this is spiritual transformation akin to alchemical transmutation. I follow Alisanos, my nose, my instincts and my intuition, and then I sweep up the flowers that fall from the heavens. My Kundalini serpent has awoken and Nataraja dances. The Green Man (11), the archetype of our oneness with the earth, has manifested and is stirring. I am in love with life, and my opalescent soul is soaring untethered and free. (1) J. Krishnamurti. Commentaries on Living. 1st, 2nd, 3rd, series. Quest Books. (2) C.G. Jung. (1989). Mysterium Coniunctionis. Princeton University Press. (3) C.G. Jung. (2002). The Archetypes and the Collective Unconscious. Routledge. (4) Sri Aurobindo. (1960). The Life Divine. Sri Aurobindo Ashram. Pondicherry. (5) Rudolph Steiner. (1923). The Arts and Their Mission. Anthroposophic Press. (7) “Merikara. Dynasty 18” from: Rosemary Clark. (2000). The Sacred Tradition in Ancient Egypt. Llewellyn Publications. (8) Nobody. (1996). Dead Man. A film by Jim Jarmusch. Pandora Film. (9) Arnaldus de Villanova. from: Gerhard Wehr. (1987). Jung, a Biography. Shambhala Publications. (10) C.G. Jung. (2000). Psychology and Alchemy. Routledge. (11) William Anderson. (1990). Green Man: The Archetype of our Oneness with the Earth. Compass Books. Lisa Falk is an alchemical artist. Some of Lisa’s artwork is available for sale in print form and in varying sizes. Occasionally original artwork is also available. Lisa can be contacted at lafalk2003@yahoo.com.au or via her website www.lisafalk.com All artwork is copyrighted by Lisa Falk – all rights reserved. For there came one in haste at early morning, who overpowered me, and pierced me through with the sword, and dismembered me in accordance with the rule of harmony. And he drew off the skin of my head with the sword, which he wielded with strength, and mingled the bones with the pieces of flesh, and caused them to be burned upon the fire of the art, till I perceived by the transformation of the body that I had become spirit. And that is my unendurable torment” And even as he spoke thus, and I held him by force to converse with me, his eyes became as blood. And he spewed forth all his own flesh. And I saw how he changed into the opposite of himself, into a mutilated anthroparion, and he tore his flesh with his own teeth, and sank into himself. Dr. Don Mannerberg takes Jungian psychology a step beyond theory — he applies it to his life. Integrating the science of medicine with psychology and mythology, he transforms his knee surgery into a quest for the Holy Grail. 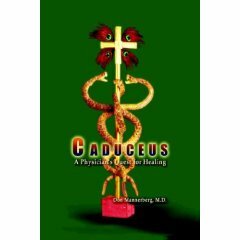 In his opus, Caduceus, he elucidates the symbolism of disease and the mystical nature of healing. With gifts of pure compassion and unique insight into basic alchemical processes, he unveils the transformational tendencies of the human psyche. His journey demonstrates wisdom of physician heal thyself. In this book, he describes the challenges and rewards of his own alchemical adventure — an adventure that many aspire to but few attempt. A true mystic of our times, he draws the map for those of us who dare to explore our own psyche in order to reclaim our own hidden, priceless treasures. Daniel Schmidt has alerted me to the fact that someone has patented the ancient alchemical recipe for Oil of Egg. This appears to be an arrogant and flagrant attempt to control ancient wisdom to make money. We all know the miraculous healing powers of Oil of Egg. According to medieval alchemists, Oil of Egg contains highly purified life force energy that can be applied to many ailments. The formula has always been in the public domain, but as of today it is “illegal” to make it without a license from a German company. This is an outrage! Frater Albertus’ Paralab sold it and making it was part of the the curriculum at Paracelsus College. PON taught it as well. Now, Jurgen Roehmig of Pohlheim, Germany, has taken out a patent on the formulation in 34 countries that makes criminals of us all. Check out the clever way their product is presented at www.roehmig.com/davinci/html/uk/uk_eggoil_01.htm. Could this be the start of a trend? I have to wonder how long it will be before corporations realize the potential of alchemical preparations and take their production out of the public domain. The basic tenet of practical alchemy is that anyone can make tinctures and oils in the privacy of their own homes. Alchemy is a grass roots effort that must remain in the control of people who serve nothing else but the very life force they carry in themselves. We are courting disaster if we work with alchemical preparations in any other way but on the personal level. Sorry, I’m just not ready for the Great Work Inc.
Because alchemy is a complex, ancient, esoteric concept for most of us, my hunch is that your first idea or picture was a traditional or stereotypical one – perhaps an old man dressed in medieval attire, surrounded by odd utensils, staring into a small furnace – but it changed into a kaleidoscope of other images and concepts. This flux of mental constructs, pictures, and feelings intrigues me. Somewhere along the broad continuum of definitions of alchemy that is created by each of our various contributions to this question is the answer. And, at some point along this continuum what alchemy truly is becomes a form of alchemy as it is applied or experienced in the world. Always a great time, outdoors with good music, good food, and lots to see and do, what else could you want for a nice summer weekend? Information at www.harmonyfestival.com. Paul and Micah from Al-Qemi will be sampling and selling their line of tinctures and other products at the event. You can contact them at (541) 345-3456. This one will be really fun! Paul and Micah from Al-Qemi will be set up and speaking at this conference about women’s spirituality and Entheogens and plant-based sacred paths, to be held at a very unique venue in the heart of wine country. I will be speaking about Alchemy and the Voice of Nature, and how Spagyric work, as a plant-based spiritual practice, is the Shamanic aspect of Alchemy. There will be many other visionary and powerful speakers from the worlds of plants and women’s wisdom, and I am sure it will be an enlightening weekend for all. Information at www.sheshamans.com. 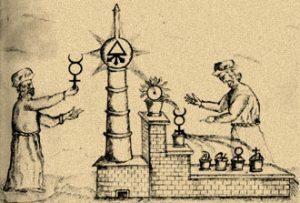 An in-depth seminar presenting teachings about alchemy, spagyric medicines, the Hermetic lineage from which alchemy derives its philosophy, and the research and work we have done to bring this ancient science out of hiding and into living practice. The teachers of this intensive have been practicing laboratory alchemists for sixteen years, focusing on Paracelsian medicine and alchemy as a plant-based spiritual path path. We have done a great deal of work with Shamanic and magical plants in alchemy, and we teach alchemy as a method of connecting to a deep and personal understanding of Nature and her energies. Cost is $350 per person, limited to 20 students. For more information contact Paul or Micah at 541-345-3456 or visitwww.al-kemi.com. This is the premiere event for products, ideas, and networking to support sustainable living at all levels, attended by over 10,000 people last year. Green Festival brings together community, likeminded leaders and businesses in celebration of sustainable economy, ecological balance and social justice. Paul and Micah from Al-Qemi will be sampling and selling their line of tinctures and other products at the event. You can contact them at (541) 345-3456. Information on the event is at www.greenfestivals.org. I am really curious about the range and variety of answers that appeared in your mind and the minds of other readers when seeing this question. We all have an image or idea that first comes into our consciousness when presented with this question. And yet, because alchemy is a complex, ancient, esoteric concept for most of us, my hunch is that your first idea or picture was a traditional or stereotypical one – perhaps an old man dressed in medieval attire, surrounded by odd utensils, staring into a small furnace – but it changed into a kaleidoscope of other images and concepts. This flux of mental constructs, pictures, and feelings intrigues me. Somewhere along the broad continuum of definitions of alchemy that is created by each of our various contributions to this question is the answer. And, at some point along this continuum what alchemy truly is becomes a form of alchemy as it is applied or experienced in the world. The three contributors to this issue share descriptions or examples of their work that are related to alchemical processes and can have a direct affect on the experience of our daily lives. Micah Nilsson makes a distinction between spagyrics and homoeopathy. Both approaches are related to alchemy and create products that directly affect the functioning of our bodies. Dr. Ajit Singh describes Electrohomoeopathy, a method that uses a special technique related to cohobation – a fundamental procedure of alchemy – to create spagyrical treatments. Lisa Falk reveals the unique, personal, transformative process she experiences and uses in her drawings I am certain will affect how you see and feel. Are these individuals alchemists? I can tell you they would not describe themselves as such. Are they practicing alchemy? You tell me.